Last year I showed you a new photo app from MacPhun for Apple computers called Snapheal. It did its job of removing objects both small and large from digital photographs. Being a standalone application, it could only work with files outside of my favorite photo editor, Aperture 3. This would mean I would have to export the photo where Snapheal could use it. Then I would have to import the photo back into Aperture after editing in Snapheal. A tedious process which kept me from using Snapheal frequently. That changed last week when a new version called Snapheal PRO was released which can be installed as a plug-in for Aperture 3, Lightroom and Photoshop Elements. It also works with Photoshop but probably not necessary. Now, it only takes a Control-Click to select Edit with Plugin… to pull in a selected photo into Snapheal Pro. Once done editing the photo, Snapheal puts the file back in Aperture as a TIFF file for further editing. Much easier and faster without the hassle of manually exporting and importing files. 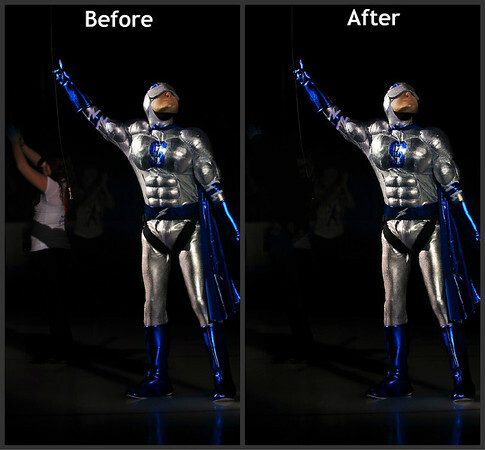 For simple edits like the photo of the Syracuse Crunch’s mascot, Crunchman, the whole process took less than 3 minutes. Snapheal Pro made quick work of the distracting person behind Crunchman. 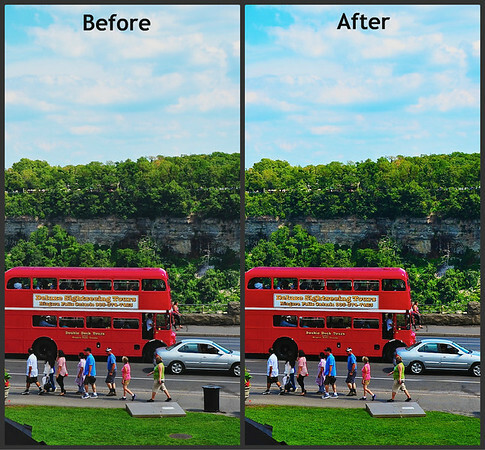 To be fair, Aperture’s Retouch brush could have done the same thing. Just it usually leaves artifacts which need further retouching and sometimes cloning. For large objects, Snapheal Pro is the right tool for the job. In the photo below, which you may recognize from my post about Niagara Falls earlier this week, Snapheal PRO only took two selections to remove the garbage can on the sidewalk and man-hole cover in the grass. Again, the process only took a couple of minutes. Snapheal Pro worked its magic on this scene to remove distracting elements. Snapheal PRO costs $39.99 US and is more than twice what the previous version cost. Along with the ability to be a plug-in, this version is much, much faster and easier to use. The interface has been streamlined and less confusing. For me, the extra cost is well worth it. Considering how much Photoshop costs, Snapheal PRO is a real bargain. However, if you own the previous version, you can upgrade for only $19.99. Note: When I first downloaded Snapheal PRO, it would not pull in the photos as a plug-in and froze up Aperture 3.4.5. MacPhun’s support team worked with me to find a solution and, within two days, had a new version for me to download which worked perfectly. This entry was posted in Photography and tagged app, apple, application, canada, macphun, new york, niagara falls, nikon D700, ontario, photo, pro, review, snapheal, software, syracuse, user. Bookmark the permalink.